Having grown up in rural Western Australia, I have always been surrounded by wildlife and I cannot remember a time when I wasn’t in awe of the natural world. 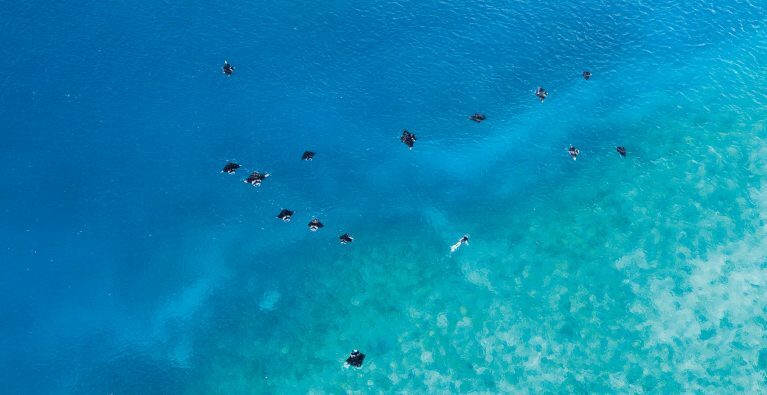 My passion for the ocean and marine life was sparked when I was five years old and my family took the first of many trips to the Ningaloo Reef. I could not get enough of snorkelling the reefs and exploring the intertidal pools to see what new creatures I could discover. It wasn’t long before everyone knew the response they would get when they asked me, ‘What do you want to be when you grow up, Lauren?’ ‘A marine biologist!’ I would say, with the biggest grin on my face. My fascination with the world around me drove me to complete my Bachelor’s degree in 2011 at the University of Western Australia, where I majored in zoology and chemistry. It was in 2012, while completing my Honours research into the visual system of the Port Jackson shark, that I discovered my love for all things elasmobranch. I knew then that I wanted to make a career out of studying these incredible animals and promoting their conservation through education. Since completing my undergraduate studies, I have been fortunate enough to work with a diverse array of marine life in Australia and South Africa alongside many incredible marine scientists. I have assisted with sea turtle research in the remote north-west of Australia and for two years I held the position of field specialist for a marine research organisation in South Africa, where I was able to contribute to research projects that focused on everything from intertidal invertebrate communities to dolphin, whale and white shark biology. These experiences have enabled me to refine my interests towards research projects that endeavour to expand our knowledge of the population dynamics, trophic role, movement patterns and ecology of sharks and rays in order to promote the development of scientifically informed management directives and the improved design of marine protected areas.